Beginning early for the good light from Burbank Airport, headed for Seattle. Many great sites out the left side on the LA/Seattle run. This is Oregon’s Crater Lake. On the Bainbridge Ferry, Seattle across Puget Sound to Bainbridge Island, where I connected with my great friend Casper Lane. And this is Casper, who lives in Indianola, with his wife Ellen. We were off to Oregon the next morning, but the first night we saw this very entertaining Beach Boys cover band. While gassing the car up, I spotted this truck with a sense of humor. Next morning, we’re off to Oregon. First stop is The Dalles, to visit Casper’s relatives. And this is their view off the back of the house, of the Columbia River, which separates Washington and Oregon. We were there late in the day and I could see that the sky that afternoon was going to be amazing, with potential lenticulars. Driving along Highway 206 through Oregon. The sky was, indeed, amazing all the rest of the afternoon and I shot many 65 mph images from the car of Mount Hood, with Casper doing the driving. This one begged to be seen in black & white. I love the challenge of shooting from the car, managing composition and focus in a fraction of a second. But, at the end of the day, I had him stop so I could shoot this one of Mount Hood from a stationary position. There are many wind farms along this highway, another subject that appeals to me. The first morning at our friends’ Rick & Danielle. And, their many working ranch dogs. Danielle graciously agreeing to be photographed. Danielle’s husband Rick, with one of his local pals. And another of his friends, Gale. Driving around Rick’s huge property yields many moments of wildlife, like these antelope. This one is my favorite, a herd of elk beautifully backlit, as luck would have it. Rick’s daughter Toney rented her property to eclipse chasers, about 700 of them. This is Ross, Toney’s husband, moving bales of hay around. Toney and Ross are in the cattle business, like her dad, and this abstract was inside one of their beat-up corrals. As the eclipse began on Monday morning, people put on their glasses and pulled up a chair. 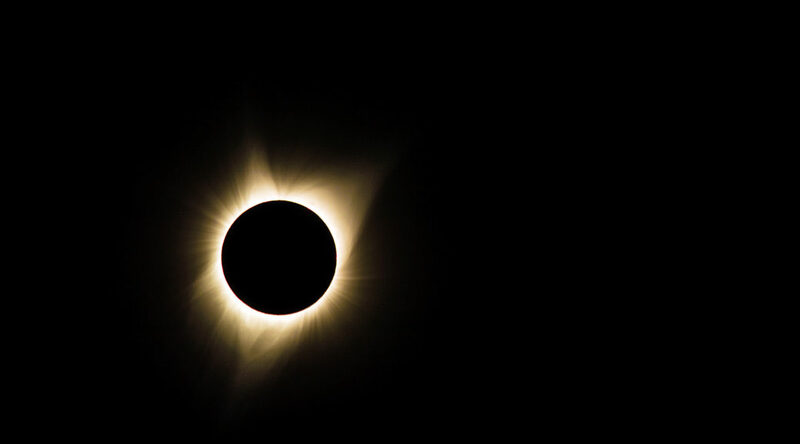 This is a Sacramento Bee photographer, Randall Benton, doing a scientific series of the big event, helped by his brother. Casper and Rick, just a couple of minutes prior to totality. This is the first one I shot, with a long lens. Quickly changing lenses, this was the second composition. And the last exposure I made. Those two minutes sped by. That night, I photographed the Milky Way in front of Rick and Danielle’s home. Heading back to Seattle and the flight home, saw these fisherman on a local river. Back on Highway 206, photographed this poor snake, who was probably not used to the tremendous increase in eclipse traffic. The Seattle port is very near downtown Seattle, also featuring Rainier. This woman is from Nepal, also on the ferry. I shot their entire family, but…she was my favorite. Just after liftoff from Sea-Tac, looking down on Boeing Field. On my way back to Pasadena.